This fall, hundreds of high school students in Colorado’s second largest school district participated in massive walkouts in protest of the censorship of their history curriculum. Students held daily demonstrations for two weeks in late September and early October, holding signs that said “Stop Censoring History” and “We Support Our Teachers.” Nevertheless, the conservative Jefferson County school board majority insisted it would continue its plan to purge the curriculum, while referring it to a committee hoping to defuse protests. Why are these reactionaries so afraid of history? Because they fear that questioning patriotic myths about America’s past will lead to students challenging capitalism’s status quo today. 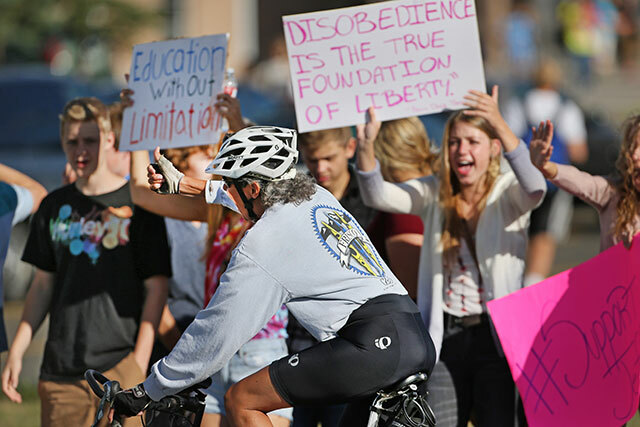 The students and teachers in the Denver suburbs were protesting outrages such as the removal of all mention of civil disobedience from texts and classroom materials. The school board would replace the College Board-approved Advanced Placement history courses with lessons that “promote citizenship, patriotism, essentials and benefits of the free enterprise system” and do “not encourage or condone civil disorder, social strife or disregard of the law.” This thought control comes from the Koch brothers’ Americans for Prosperity outfit that financed the school board election takeover. Liberals seized on the controversy, as the pro-Democratic Party NGO (“non-governmental organization”) MoveOn.org sponsored student petitions against the curriculum censorship. Colorado’s lieutenant governor Joe García, a former college professor, showed up at a student rally. The protests showed the potential for united student-teacher struggle. But while their protest was directed at a particularly reactionary school board, the ruling-class assault on public education is coming from conservatives and liberals, Republicans and Democrats alike. What’s going on in Colorado is part of the national battle over public education, in which Democrat Obama and his education “czar” Arne Duncan are spearheading the privatizers and bashers of teacher unions. The White House is demanding that schools adopt a national “Common Core” curriculum while pushing “pay for performance” schemes and seeking to eliminate seniority rights and teacher tenure, which is nothing more than protection against arbitrary firings. Yet teacher unions keep rounding up votes for Democrats, in Colorado and elsewhere. The initial “Jeffco” student walkouts in late September coincided with the first of two teacher sickouts which forced the district to cancel class at four schools in two weeks. The Jefferson County teachers union (JCEA) had been involved in a bitter fight with the dictatorial school board over its imposition of pay determined by administrators’ ratings, and the board decision to cut raises for teachers deemed “partially effective.” The teachers responded with a unanimous vote of no confidence in board chair Ken Witt. Next door in Douglas County, a like-minded right-wing school board (also financed by the Koch brothers juggernaut) instituted “market-based” salary schedules and “school choice,” evaluated educators according to a state “teacher effectiveness” law and eliminated collective bargaining, leading to a sharp membership loss (25%) for the local teachers union and a big increase in teacher turnover (70% higher than the state average). Jeffco teachers could see the handwriting on the wall as their own school board followed the Koch playbook. The Jefferson Country school board is following in the footsteps of Texas, whose state school board has rejected the APUSH and the Common Core, revising the state’s social studies curriculum to (according to critics) “promote Christian fundamentalism, boost conservative political figures, and force-feed American ‘exceptionalism,’ while downplaying the historical contributions of minorities.”2 Texas is the second largest buyer of textbooks in the country, making its curriculum influential to national publishers. Under RTTT, 43 states in five years have “voluntarily” adopted the CCSS. To receive RTTT grants, school districts must agree to high-stakes testing (beginning as early as kindergarten), student test-based evaluations of teachers, the Common Core, and lift caps on charter schools. With the rhetoric of “school choice and competition,” many liberals and conservatives champion the spread of the privately-operated for-profit charters, which take public funding and space from public schools, but underserve special needs students and English language learners. Money for smaller classes, experienced educators, and resources for underserved public schools in poor and working class areas will instead go to education monopolies like the textbook-publishing, test-developing and grading juggernaut Pearson, and their expensive CCSS aligned materials and technology. 3 Educators are forced to “teach to the test,” as teacher evaluation systems are increasingly based on student test scores. “Failing” public schools are closed to make way for more charters. Liberals who have denounced acts of censorship on the part of ultraconservatives remain largely silent on the dumbed-down, scripted training proffered by the Common Core. As Marxists, we understand the attacks on working-class education and the increasing privatization and corporatization are part of a movement to restrict public education for the vast majority of working class students and reorient it to the needs of employers and the imperialist war machine, combined with the deskilling of teachers and busting of their unions. This is the principle underpinning the CCSS: the purpose of schooling is not to prepare students to think – only to be what Karl Marx called “wage slaves.” The ruling class has little need for, and indeed is threatened by, students who know the lessons of history. But students and teachers in Jefferson County, Colorado have refused to be regimented, and their example is spreading. In mid-November, thousands of high school seniors in the Denver metropolitan area refused to take high-stakes, state-mandated science and social studies tests, including more than 1,500 in Boulder high schools and nearly 1,900 students in nine Douglas County high schools, more than half the students affected. This points the way to fighting the capitalist assault on public education, but it poses sharply the need for a class-struggle leadership of teachers unions to replace the present misleaders who have sold out students and teachers to the Democrats. Historically, denying education to the oppressed has been a means of reinforcing social control and constraining working-class consciousness. Under slavery, it was illegal, and often subject to heavy punishments, to teach slaves to read or write. The CUNY Internationalist Clubs fight for free quality lifetime public education for all under student-teacher-worker-parent control. This simple democratic demand can only be fully realized as part of the broader fight for the socialist revolution that alone can make it possible for education to serve the interests of working people and the oppressed.